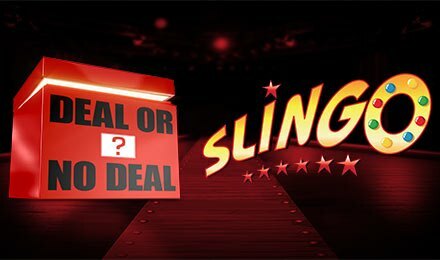 Combine the gameshow, Deal or No Deal with the Slingo brand and you come up with Slingo Deal or No Deal! It is a creation of Gaming Realms which you can enjoy at Vegas Spins on any type of device. It is also a combination of bingo and slots. Set against a dark red backdrop, it is played on a 5x5 grid which contains numbered boxes. Your aim here is to match a number so that the corresponding box reveals and eliminates one of the displayed prizes on the paddle. Also, find original features like the Banker’s Offer. Are you all set for a great game? Kick off your gameplay on Slingo Deal or No Deal by selecting one of the bet values on the Stake field. Next, hit the green “Start Game” tab to launch the reel found at the bottom of the grid. Pick your lucky box, while the others fill up the Slingo grid. Initially, you are provided with 10 spins. Similar to the TV show, match the numbers found on the grid with those landing on the reel. If any of them matches, the box opens and the corresponding prize value is eliminated from the paddle. To create a Slingo, you need to obtain 5 opened boxes next to each other horizontally, vertically or diagonally. If you wish to increase the value of the remaining prizes, try to create more than 5 Slingos. Bet Levels: There are no bet levels offered on Slingo Deal or No Deal. Amount of Paylines Selection: No paylines are available on this game. Coin Values: The different stakes range between 1p and £100. On Slingo Deal or No Deal, you can always purchase extra spins when you have already played all your 10 initial spins. This enables you to continue your gameplay and enjoy more winning opportunities. When the Free Spin symbol appears on the single slot reel on Slingo Deal or No Deal, you are rewarded with an extra spin at the end of each game. No Deal: Open your lucky box and collect its prize value. Deal: Take the Banker’s Offer and the game is over. Spin: Simply continue with the game. If you choose to continue playing, you can trigger another offer from the Banker after each spin. The same 3 options are provided each time. You must have come across the Jokers on Slingo Deal or No Deal! They act as Wilds and are used to open any box in the column. Look for Super Jokers as well, because they also stand for wilds which can open any box on the whole grid. Have you noticed the Devil symbol? On Slingo Deal or No Deal, it blocks any possible matches on the grid. Discover innovative game features as you load Slingo Deal or No Deal at Vegas Spins. Wish you all the best!